3 Wheel Scooters for kids are a great way to get your kid away from the TV and out into some fresh air! The latest rage in 3 wheel scooters are the self propelled kind, that you wiggle and go. No pushing off the ground, no charging a battery needed. Just leaning their body weight from side to side propels the 3 wheeled scooter and off they go. 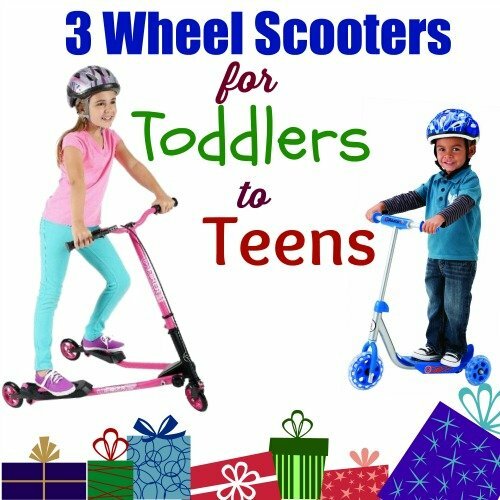 We’ve been doing the research, as this is an item on my daughter’s Christmas list this year, and there are a lot of different kinds of 3 wheeled scooters to choose from. Check out the different styles and features below to make the best choice for your kids. The first scooter for your toddler or preschooler should have the more stable 3 wheel scooter design. As they are learning, the third wheel helps them to keep their balance when gliding, giving parents a little added peace of mind. This kind does need for your child to push off to get any forward motion so we call them ‘kid powered’. As with any moving playtime activity, safety gear is recommended. Here are a few of the best scooters for younger children ages 3+. Razor Jr. has a couple of styles of scooters that are really cute called Kix and Kuties. The Razor Jr. Kix Scooters come in several designs like the Robo Kix, Monster Kix, Zombie Kix and a Kitten Kix shown in the picture at left. They have big foam ‘hands’ on the handlebars that your child sticks their hands under making them appear to be your child’s hands. You can see examples of each of these styles below. The Razor Jr. Kuties Scooters are actually 2 toys in 1. They are both a fun scooter in a Horse or Unicorn theme, but they also have the dual ability to use the handle bar as a fun hobby horse toy as well. I loved seeing this because it reminded me of running around the house with my own hobby horse as a kid. It was so much fun playing the Lone Ranger and Tonto with my brother! The self propelled 3 wheel scooters are pretty darn cool! I love that the kids don’t have to push off the ground to get going. Simply shifting body weight from side to side seems to ‘magically’ propel the scooter forward. I was always afraid my kids would run over their own foot or trip when using the kind that you have to keep pushing. The self propelled scooter eliminates the need for all of that, and responds almost like a skier would doing the ‘snow plow’ on a bunny hill. Pretty awesome huh? Check out the video below to see one in action. Looking to take scooting to the next level? Electric 3 wheel scooters can give your kids the fun of a scooter without all that pushing or wiggling. The electric kind are also great for longer distances because many of the different styles offer dual movement where you can use the manual push action, ‘wiggle’ action or the electric motion. If you’re going on a longer ride, this can be helpful if you get tired out and want to keep up with the rest of your friends. Some of the more popular styles for all ages are featured below. These are fun for the younger ones who want the easy go power of an electric scooter. Characters like the Ninja Turtles or Spiderman for boys or Frozen and Doc McStuffins for girls. They have a top speed of 1.75 mph, a maximum weight limit of 50 lbs. They will go for about 40 Minutes of ride time and have a 6 Volt system with 300+ charge cycles on an 8 Hour charge time. Recommended for ages 3 and up. Find your little daredevils favorite here! For older kids who want a little more speed from an electric scooter, there are a few models that really look like a speed freaks idea of fun! We didn’t really need to look at these kind for our six year old – but couldn’t resist at least taking a peek. These electric powered scooters are really kind of cool looking, and I wouldn’t mind trying my hand at riding one. The Trikke Pon-e 48V Scooter shown to the left is like a sports car of scooters to me. I can just imagine myself or my older kids zipping on down the side of the road like a boss! There are different power levels with many of these motorized 3 wheel scooters, some have more power for hilly terrain, others are more for a leisurely cruise around the block or maybe a great idea for using around campus? I didn’t really dig deep on these, but thought you might like to check them out for yourself and see if an electric scooter will better suit your child’s needs.